Snowstorms remain relentless this season, dumping successive blankets of snow upon Connecticut. Despite occasional peaks in temperature above the freezing point, the snow is now so thick that it’s capable of effectively insulating itself against rapid melting. Photo of the Week #6 features one of many pools that briefly gather water as Falls Brook spills down the gorge at Kent Falls State Park in Kent, Connecticut. 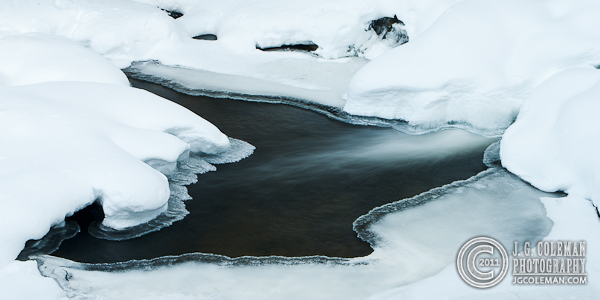 The snow blanket has enveloped all stream-side detail, including the cascades that fill these small pools. From the bottom of Kent Falls looking up, it’s difficult to tell a river runs beneath the uniform crust of ice and snow. Photograph of Kent Falls (Aqua Obscura) © 2011 J.G. Coleman Photography. View more photography by Trails of Freedom Chief Researcher, Justin Coleman, at J. G. Coleman Photography.